et an educator might be more likely to find people whoshare their most specialized interests in a global community than at their own institution- hence the power of the PLN, the online affinity space, the online community of practice,or the connectivist MOOC experience. Hear, hear! I'm alone at my institution! But, with pedago.me, I'm less alone and empowered! A university educator may, inthe course of their career, need to call for help from various members of their own in-stitution, but they should also have enough agency to find that support elsewhere ifappropriate. I'm so happy that I was invited to pedagome! I'm literally all alone in my pursuit of faculty development, and pedagome has quickly become my favorite part of teaching and learning! Each participant is encouraged to switch between these pathsthroughout the MOOC as they see fit. love that there is a choice to switch back and forth, I'd be worried I made the wrong decision if I were locked in! This becomes important for all constituents bringing an outside perspective to theconference participants, giving those who do not have the means to travel a glimpse ofthe conference, and providing the conference organizers with a boost to online atten-tion and participation with the conference. Important point here that these live streamed events don't just benefit the people at home who were unable to attend the conference, but also help boost conference participation and visibility online. The graduate student stage in my journey was incredibly defining, and many of the concepts and themes I was exposed to there are still very present in my day to day work. Another version of the most ambiguous element of our modern edtech lexicon. Fluency, literacy, what do we want to call it and how is it defined? Not to get morbid, but people dying is likely our hope towards this concept stabilizing (surely just in time for something equally confusing to crop up). Instructional designers exist to bridge the gap between faculty instruction and student online learning. I'm really feeling connected to this statement and consider an important part of my role as an [instructional designer] is to empower student voice and involvement in the decisions being made, while also balancing instructor support. Honestly, this list doesn't get me particularly excited though. I'm a bit surprised by this. Adobe's programs are really complex and maybe too finicky for most graphic needs? One of the things sadly missing from this list is that I'd love to see "Recommendations from Instructional Designers" Where is it?!? Anyways, I'd say I'd love to see more folks being open practitioners of their work where they can. Publish openly, foster relationships openly, and learn in the open. That may be a way for us to not have a "What do ID's do now 2020 edition?" I love learning from people who share their thoughts and experiences, good or bad. Just so much to learn through such connections. I've been doing a bit of coding here and there, and I'd like to learn more for sure! why we need to be curious, life-long learners! Wow! Would love to know where they have a shop this big and hear how that operates and see what they produce! I would think that would be a fun environment to work in, with high quality design and dev in courses. Sounds appropriate. Love-hate relationships and all. Yo Roman, you have a 12 hour day. When do you see your family and such?!? This represents a major issue to me. The tool potential is directly correlated to funding. The UCF's can build RealizeIt into their long-term vision while others struggle to scrape together approval for a few free Wordpress sites. I feel this stems from instructors never having been students in the online space. Often they don't have a basis to develop online learning experiences because they only know face-to-face learning. Consequently, getting more instructors engaged in online communities as learners themselves would be a great introduction for online learning as a means to prepare them to facilitate their own online courses. 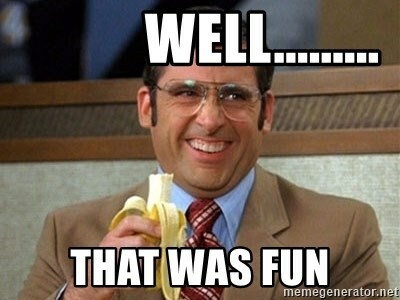 Looking at you fun places I've spent learning: #clmooc #netnarr and such. For those interested in digging deeper after tonights #Pedagome chat, let's dissect Neil Postman's, 5 Things We Need to Know About Technological Change. Should be a fun "then and now" perspective.